Richard Diebenkorn died in 1993 at the age of 71, at precisely the same time the art world was in the thrall of Identity Art and suspicious of high modernist art in general. Nearly two decades later, Orange County Museum of Art curator Sarah C. Bancroft is presenting an exhibition which aims to qualify his Ocean Park series as one of the "crowning achievements of postwar painting." The 80 works on view--paintings on canvas, works on paper, and prints-make a stunning affirmative case for Diebenkorn's achievement. 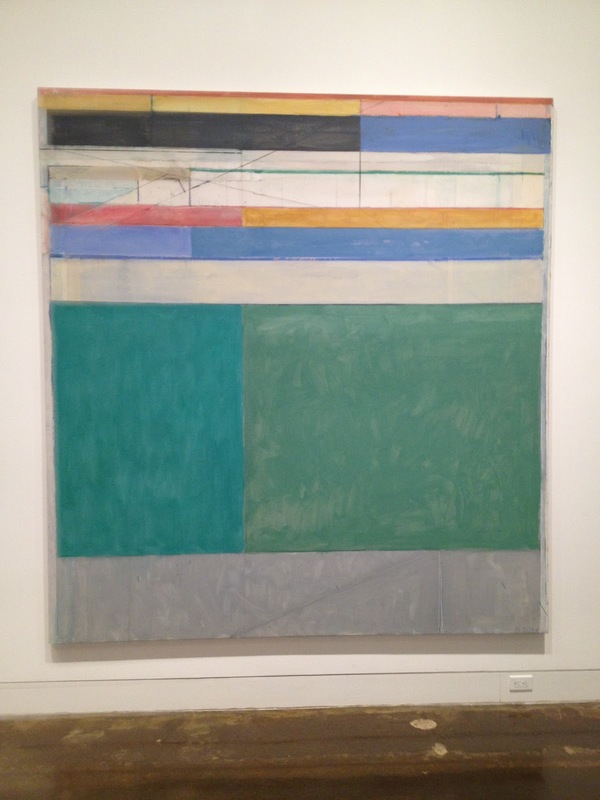 It also makes a convincing case that Diebenkorn is one of the greatest painters this country has ever produced. Starting in 1967, Diebenkorn's Ocean Park Series occupied him for 25 years and about 140 paintings. It is fascinating to see the series develop from work to work, from year to year. The paintings on view are mostly from museum and private collections. Diebenkorn was the epitome of the painter's painter. In the Bay Area he was part of a coterie of artists which formed the Bay Area Figurative school. But by the time he moved to Santa Monica in 1966, he would embark on the most important phase of his career. 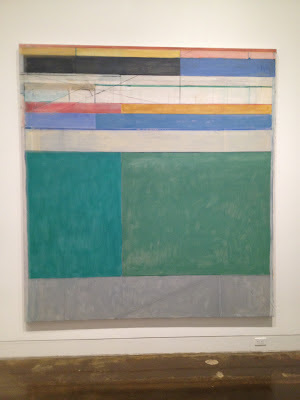 No one was making this kind of nuanced abstraction in the 1960s and Diebenkorn was pretty much alone. At that time, the Greenberg circle which had years earlier recoiled at Diebenkorn's figurative apostasy (recounted in Caroline Jones Bay Area Figurative Art) was on the modernist march of stain painting, while the Minimalists had no use for Diebenkorn's illusionism and arch stance. Diebenkorn never had the support of the high academic art establishment either--his name is mentioned one time (no reproductions) in Art After 1900 the recent Krauss, Buchloh, Foster, and Bois survey book. 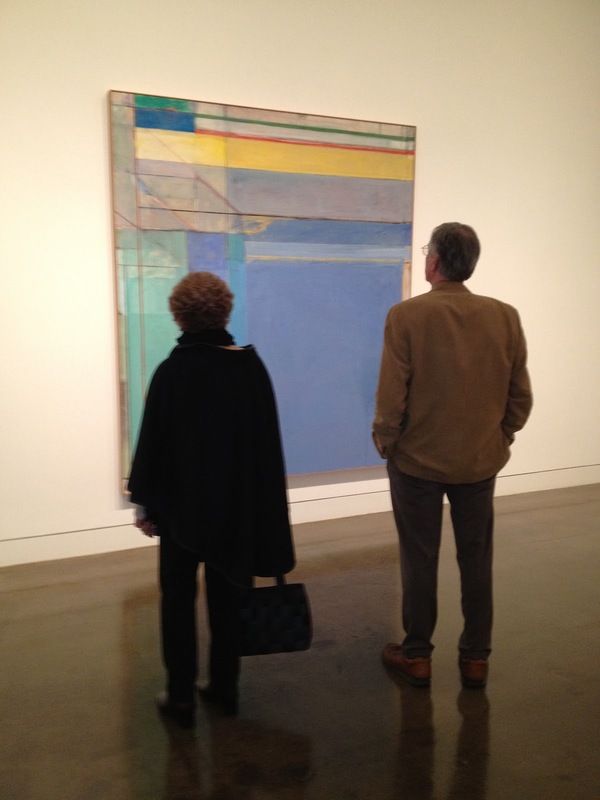 Diebenkorn did find favor with important mainstream critics like Robert Hughes and Michael Kimmelman. His biography is one of a prolific painter committed to a rigorous studio practice with little drama and art world intrigue. After he abandoned abstract expressionism in 1955, Diebenkorn spent the last 40 years of his life in an essentially conservative artistic project but one that produced a higher great to bad painting ratio than perhaps any other painter in the post-war period. The exhibition takes the viewer on a journey of how color, gesture, line, and space can be manipulated in such diverse ways from painting to painting to evoke a completely different aesthetic response. The paintings from the series are all related like a family, but so different in how they act on the viewer. Some have a decidedly Mediterranean/Southern California feel while others are more austere and restricted in palette. The variation from canvas to canvas in terms of hue and value is what gives each painting their content. Diebenkorn's facture varies also and his famed pentimenti of faded lines, erasures, and scrapings reveal Diebenkorn's unmatched touch. The inclusion of works on paper and prints usually superfluous to paintings in these types of shows warrant close inspection. They are as good as the paintings, including some amazing prints produced for Gemini G.E.L. and Crown Point Press. The installation itself sets an example for museum exhibitions of this kind; one painting per wall. The viewer never feels overwhelmed but instead leaves wanting to see more and more of them. One quibble with the catalogue is that we never have a good discussion of how he painted the Ocean Park series. Did he use tape? What kinds of mediums and pigments did he use? How many did he reject? How long did he generally work on each one? What was the measure of success for Diebenkorn? How then for us to measure Diebenkorn's success? He wasn't an innovator in the sense that Pollock or Newman were in creating new possibilities for abstraction. But what he did was forge his own original style and maintain a level of quality unmatched year after year in the careers of so many artists. This sustained briilliance then is his achievement. Ocean Park is its summation but it spanned his AbEx work, and his decade long foray into representation. In this way, Diebenkorn's work is a challenge to contemporary painters who faced with dwindling plastic possibilties for innovation can hang their hats on making the best possible work irregardless of the deterministic impetus that Diebenkorn rejected and somehow transcended. There is a telling anecdote I learned about at the opening of the exhibition. One of the Ocean Parks on view is from Eli Broad's collection and I was told that since Broad bought the painting in 1976, it had gone directly from the gallery where it was purchased and right into Broad's bedroom and has hung and stayed there and never moved from there until this exhibition. That is nearly 40 years with the same painting for a man who could look at whatever he wanted. It proves that Diebenkorn's Ocean Parks are endlessly fascinating and that this quiet painter may not have been making much art news all those years, so much as making art history.